Their fourth album sees the Scrapomatic core duo of Mike Mattison and Paul Olsen joined by guitarist Dave Yoke, Ted Pecchio on bass and Tedeschi Trucks Band drummer Tyler Greenwell, and the result is very much a band record rather than the duo plus backing (admittedly, very classy backing, but still a group of session musos playing someone’s arrangements of the material the duo has delivered) on Scrapomatic. In between, of course, we’ve had Alligator Love Cry (2006) and Sidewalk Caesars (2008) and a regular gig with the Derek Trucks Band and, more recently, the Tedeschi Trucks Band for singer Mike Mattison. That probably goes a fair way to explaining the four year gap before album #4. Olsen probably has plenty to keep him occupied on the writing, arranging and musical director side of things, so there mightn’t be quite the sense of financial imperative that comes with something that’s your main gig, but a run through the dozen tracks on offer here reveals an interesting mix of styles that fit comfortably under an overall understated blues rock umbrella. Produced by Mattison and recorded at Derek Trucks and Susan Tedeschi’s Raga Swamp Studios in Jacksonville, what we’ve got here is another manifestation of the emerging family of related projects that brought us the Derek Trucks Band’s Already Free and the Tedeschi Trucks Band’s Revelator, and on the strength of a dozen listens it’s another exercise in tasteful blues based rock that mightn’t demand your attention right this minute and hold it right there, but probably won’t have you reaching for the shuffle button either. Two contrasting voices, Mattison’s rasp and Olsen’s croon and an increasingly rocky approach as Yoke and the rhythm section integrate themselves into the overall approach means there’s always something interesting going on, and when you focus on the lyrics there’s a little more than you might have thought, which I’m inclined to ascribe to Mattison’s background in literature. That definitely seems to be the case with the serial killer exacting vengeance down on the bayou among the shotgun shacks and magnolia trees in Alligator Love Cry. Olsen’s I'm A Stranger (And I Love The Night) delivers an evocative take on the post-dusk autumn streets of New York City, and the tempo lifts for Rat Trap, which gives the rhythm section a solid workout and Yoke a chance to cut loose. The vibe continues through Night Trains, Distant Whistles, which isn’t quite the wistful number the title might suggest. Things drop back a tad for Don't Fall Apart On Me Baby and I Surrender, but they’re rocking out from the kick off in Mother Of My Wolf, where the literary bit gets another airing (I said ‘I just come out from high school’/She said ‘I read Camus in jail). The down and dirty blues kicks in on Crime Fighter as Mattison’s falsetto gets a workout and Yoke delivers some guitar licks that are straight out of the less is more school of playing handbook, with shades of Mike Bloomfield in the precision cut solo. The horn-driven Malibu (That's Where It Starts) grooves along nicely but comes to a rather abrupt end, pitching the listener straight into How Unfortunate For Me, one of the album’s highlights, with muted trumpet delivering a touch of New Orleans as Mattison wryly observes the pitfalls of infatuation (With you I am enchanted/How unfortunate for me). If I’ve got a gripe with the album, it’s aimed at the sequencing, since despite the possibility that The Party's Over there’s the suggestion that we make it one more for the road, which might have been the right place to stop, but they’ve opted to go one more for the road. While Gentrification Blues ties in with some of the album’s lyrical themes, it isn’t the strongest closer you’ve heard. At the same time I’m not sure else where else it might fit. One for the shuffle button, I fear. Still, while it might have finished more strongly without that last track, I’m a Stranger (And I Love the Night) delivers a satisfying listening experience and a passing visitor a couple of days ago was heard to remark on the quality and ask who it was, so it definitely has something to offer. 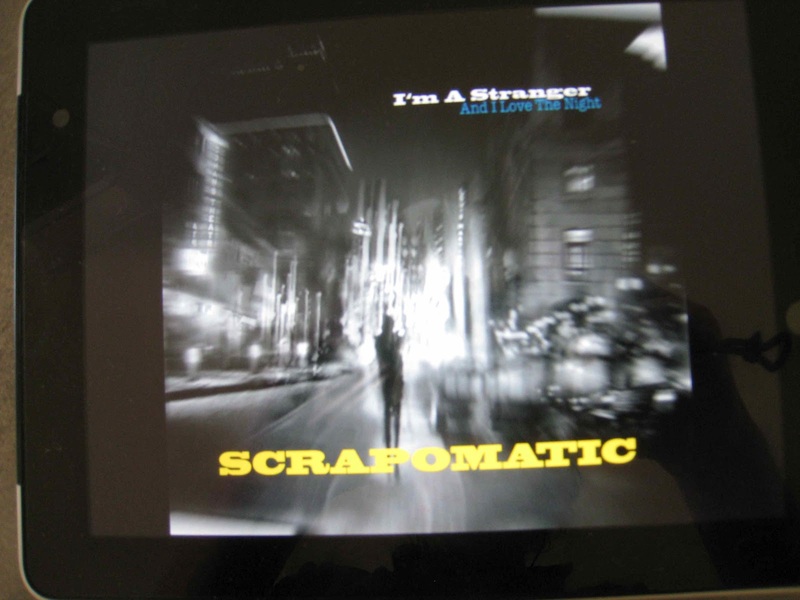 There’s plenty out there that falls under the umbrella of Americana, but Scrapomatic’s semi-noir take on the genre is worth a listen, and I’ll be watching the horizon for rumours of album #5.